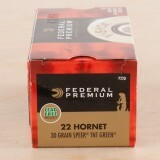 22 Hornet is one of the smaller centerfire rifle cartridges available but it packs a nasty "sting" against varmints, firing a light bullet at a high velocity for maximum fragmentation. 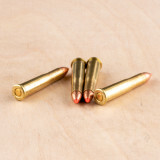 .22 Hornet loads typically fire a light bullet in the 35-50 grain range at a muzzle velocity at or slightly under 3,000 feet per second. 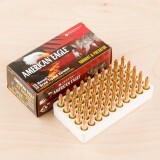 This gives them excellent medium-range performance against rabbits, squirrels, coyotes, and other pests. 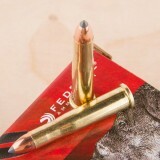 The .22 Hornet is well suited for reloading due its centerfire design; many handloaders prefer it to rimfire varmint cartridges like the .22 WMR for this reason. 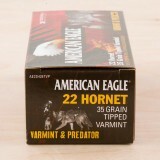 An excellent choice if you're in search of a great 22 Hornet round for varmint hunting. 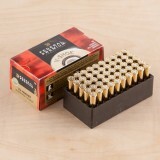 This New Federal ammo comes loaded with a 30 Grain Hollow-Point (HP) along with a Boxer primer that's loaded in a Brass case. With this package, you'll receive 50 rounds ready to fire. Plus, you know it'll come fast from our warehouse to your door because we know shooting ammo is a lot more fun than looking at it online or waiting on delivery! 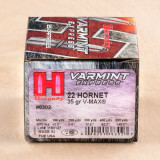 An excellent choice if you're in search of a great 22 Hornet round for varmint hunting. 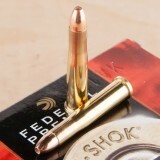 This New Federal ammo comes loaded with a 35 Grain Polymer Tipped along with a Boxer primer that's loaded in a Brass case. 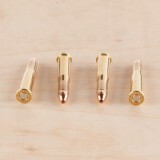 With this package, you'll receive 50 rounds ready to fire. Plus, you know it'll come fast from our warehouse to your door because we know shooting ammo is a lot more fun than looking at it online or waiting on delivery! 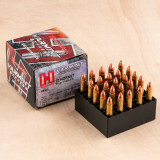 When you want something with amazing speed and great results, the .22 Hornet is a great choice. Developed in 1930, this round is highly effective and is perfect for all your match competing, varmint hunting, and small game hunting needs. 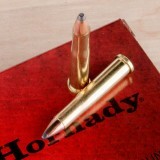 Hornady has been making some of the best ammunition in the world since 1949. 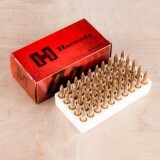 With their amazing manufacturing practices and bullet innovation, they have created some of the most effective calibers and ammunition on the market. 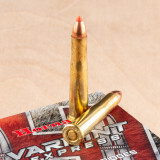 These Varmint Express rounds feature V-Max projectiles that weigh in at 35 grains. 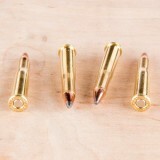 The V-Max bullet offers immediate expansion and fragmentation upon impact for quick kills against small game and varmints. 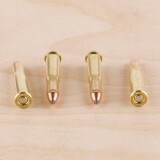 Each bullet is pressed into a fresh brass case that comes boxer primed. 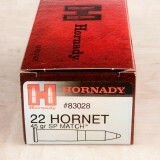 These 22 Hornet rounds fire at 3100 feet per second and will take out the pesky varmints around your property.